I spent most of the first year after my layoff just wanting to go back. Back to the job I had so passionately loved. Back to the routine that was so familiar. Back to the students with whom I felt so at home with. Back to the career that had been moving along at a sedate but solid pace. I just wanted to go back. I found a temporary position that first year, which assuaged my longing for the classroom. It was a challenging position for me, and I grew from it. But it was temporary and ended with the school year. 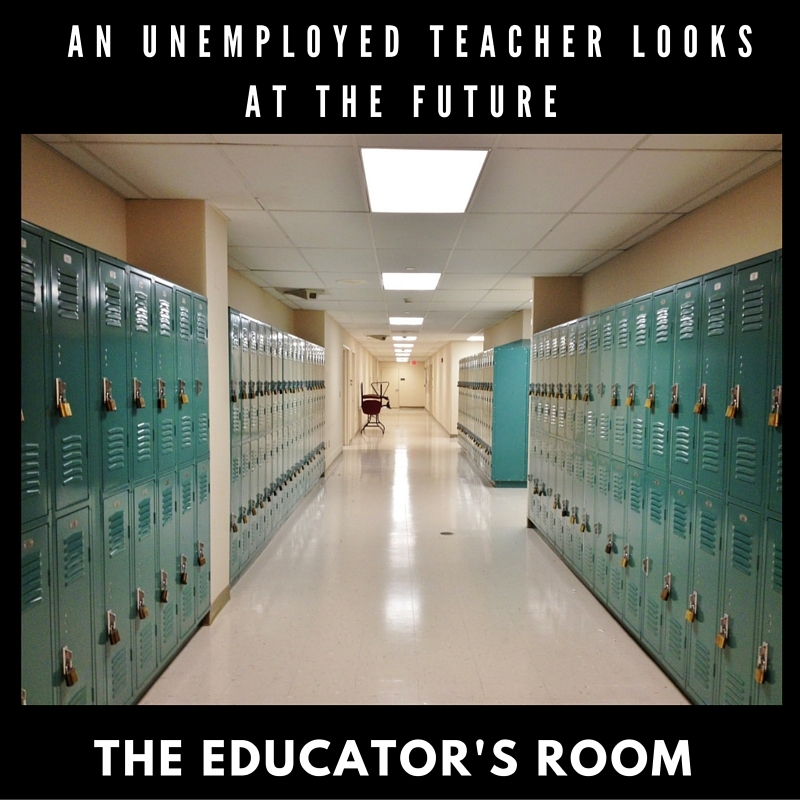 At the start of the second school year as an unemployed teacher, my perspective began to change. As previously mentioned, I took several substituting jobs in the first few months of this school year. The jobs were at my old school – the place where I’d felt so at home for the better part of a decade. But the subbing was disheartening. In a building where I had invested so much of my time, energy and passion, I got double takes and confused looks from people who thought they recognized me but didn’t quite remember from where. Others who I’d worked more closely with said hello but there was none of the old camaraderie. The difficulty of being back in the halls that no longer welcomed me was an important step for me: I needed to get past the point of wanting to go back so that I could finally go forward. Finally, 18 months after my layoff, I’d found the closure I needed on a chapter of my life and my career in education so I could open a new chapter. For me, the closure was a two-step process. First, the subbing at my old school helped me close the door on wanting to go backwards. Second, my continued search for a teaching position with no results (not because I wasn’t hired, but because there are simply no positions open in my field) allowed me to finally understand that perhaps I could look beyond finding a classroom position in order to continue teaching. What I discovered during this process was that the more I welcomed change and began thinking of myself as a professional in a new way, the more doors began opening in front of me. In late September I began writing for The Educator’s Room, which has opened up opportunities and relationships that have already helped me to grow professionally, and have helped me gain courage on my new path. I was offered contract work as an online teacher, which is allowing me continued interaction with students, curriculum and new technology skills. I completed my thesis and will earn my second master’s degree so that I can pursue teaching at some of the local community colleges in several months. Pieces of the puzzle of how I will make a new living but still continue as a teacher have begun to fall into place. I also began exploring what my personal brand might be. As Franchesca Warren asks, “What’s your brand? If you suddenly no longer have a job, what will you do with that brand?” The steps to discovering a personal or professional brand include determining your area of expertise, deciding what your brand stands for, strategizing about marketing your brand, and operating as an expert and building your portfolio. This can be a seismic shift in thinking for many teachers. By its very nature, teaching follows a very traditional, comfortable career model that doesn’t require much contemplation of individual marketing and individual branding. But with the seachange in job security in the education field, that comfortable model is disappearing for many teachers. I had to do a lot of internal work to find my own personal brand and the area of expertise I wanted to pursue. I discovered that while part of my teaching philosophy includes student choice and student ownership of the learning process, I had been struggling against a system that did not encourage those things. Now that I am outside the system, how could I continue to be an expert teacher in the field I love (upper level social sciences) without a classroom? I am more than a tutor – I am licensed in multiple states, have two masters degrees and long term experience as a highly qualified teacher. Just like a lot of out-of-work teachers. So how can we take these skills and apply them to a changing world of education? As I researched and contemplated the answer to this question, I was inspired by the idea of concierge physicians. A concierge physician is a doctor that provides private healthcare on a fee-for-service basis. Why couldn’t teachers provide the same services? There are so many students, especially older students, who are individualizing their education now – whether by online courses, homeschooling, taking college courses while still enrolled in high school, or just trying to work their way through a system that often doesn’t meet their educational needs. A concierge teacher, similar to a concierge physician, makes house calls to teach curriculum to individuals or small groups. But there is more versatility available for teachers than doctors because personalized curriculum can be shaped for students using online communication as well as one-on-one teaching. With a licensed, trained teacher, the student can be assured of meeting state standards or being properly prepared for a necessary exam. I was deeply inspired by The Educator’s Room writer Paula Kay Glass, who left traditional education to start her own school and has been doing so for almost a decade. I realized that my thinking truly had changed because I no longer wanted to be the teacher of my past, but a teacher of the future. Flexibility, technological skills, comfort with student choice / student-led learning are part of the future of education. So I’ve decided to become the first Concierge Teacher (I checked, there aren’t any of them …yet!). I will be working on starting my own new teaching business ; hopefully, it will be a way to serve students who are, for whatever reason, outside the traditional education system. It’s a broad enough idea, and I am a strong enough believer in open sourcing, that I hope this might begin a new model for teachers who have also found themselves outside the traditional education system. There are exceptional teachers in every school district in this country, and thank goodness for that. The school system only remains intact because of the dedication of the teachers who have continued to make it work, despite lowering budgets, lack of resources, and hostility towards educators. But there are also exceptional teachers who are now outside the school districts because of those same lower budgets, lack of resources and hostility towards educators. That latter group of teachers, including me, must find a new way to teach or leave the profession they love in order to make a living. For now, I’m still not willing to leave the profession I love – so finding a new way to teach is my way forward. I've been doing this for a few years, since Latin positions are hard to come by in Canada. I teach at a private school part time (last year it was two schools), tutor privately and teach international students who need Latin for when they return to their home country. I also have a Facebook page as well as my blog, where I post little pieces that may be of interest to aspiring Latinists. While I don't use your title, I definitely worked on branding myself. This way I get to do what I love in an economy and school system that are not Latin-friendly. Bona Fortuna! How wonderful! I love the creativity of teachers in these hard times, and it sounds like you've really built something for yourself. I'm still working on the branding side of things, so it's encouraging to hear about successful teachers – Your work sounds fantastic! Awesome! I'd bet that the energy you bring to your teaching will be more vibrant, as a result. My husband and I are doing somewhat the same thing – branching out after 20 years of running an arts mentoring nonprofit to offer an affordable 'new breed' of evaluation/assessment software to grassroots nonprofits. It's a process, isn't it, this growth thing?! I am thinking of starting to teach music and or languages from home. Thanks for sharing!!! I’d like to know how things are going for you now? I myself am at a similar crossroads, however I’ve been outside of the classroom, since 2009 due to budget cuts. I started my own tutoring business shortly after, which did really well up until 2015. I transitioned to a nonprofit organization and now I am at a standstill. I’ve been exploring writing( co-authoring my husbands life story, poetry, would like to blog) but really looking into rebranding myself. Like you, I found myself going backwards, my credential needs to be cleared, I’m good enough to be a substitute, but not a regularly employed teacher, based on my experiences in districts where I live. I am now WAITING and that waiting is driving me crazy. I would love to open my own school, I have helped so many students overcome their struggles, obstacles and barriers on this side of the education system, but I am at a crossroads, because nothing is happening. Anyway, your article really helped me to see I am not alone. It is time to step into my greatness and not be afraid!